Data Literacy: How to Make Your Experiments Robust and Reproducible provides an overview of basic concepts and skills in handling data, which are common to diverse areas of science. Readers will get a good grasp of the steps involved in carrying out a scientific study and will understand some of the factors that make a study robust and reproducible.The book covers several major modules such as experimental design, data cleansing and preparation, statistical analysis, data management, and reporting. No specialized knowledge of statistics or computer programming is needed to fully understand the concepts presented. 2. How to identify a promising research problem? Dr. Neil Smalheiser has over 30 years of experience pursuing basic wet-lab research in neuroscience, most recently studying synaptic plasticity and the genomics of small RNAs. He has also directed multi-disciplinary, multi-institutional consortia dedicated to text mining and bioinformatics research, which have created new theoretical models, databases, open source software, and web-based services. Regardless of the subject matter, one common thread in his research is to link and synthesize different datasets, approaches and apparently disparate scientific problems to form new concepts and paradigms. Another common thread is to identify scientific frontier areas that have fundamental and strategic importance, yet are currently under-studied, particularly because they fall “between the cracks” of existing disciplines. 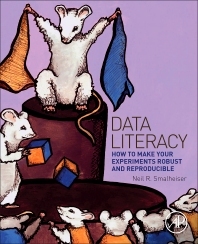 This book is based on lecture notes that Dr. Smalheiser prepared for a course he created, “Data Literacy for Neuroscientists”, given to undergraduate and graduate students.